Warrior tattoo designs are visually powerful, and they have deep connections to many cultures of the past. Aside from linking people to their heritage, warrior tattoos are an inspiring reminder of one’s aspirations, helping people to stay mentally strong in the midst of tough situations. Below, we’ve put together a warrior tattoo dictionary, explaining the significance of each unique warrior tattoo design. Celtic Warrior: representing the people of Irish, Scottish, or Welsh descent, Celtic warrior tattoos have a long history. Typically, they feature the intricate knots found in Celtic art, and the warrior figure is viking-like in stature and style, sporting a long beard to show his virility and power. Christian Warrior: known as the Crusaders of the Middle Ages, these soldiers fought for Christian faith. They’re often depicted before a banner with a red cross. Geisha Warrior: this tattoo design is a new take on the warrior tattoo type, which gives a new meaning to the traditional title ‘geisha.’ A geisha’s duty was to serve men, but a geisha warrior is a symbol of intrigue, mystery, and power. Inca Warrior: these tattoo designs typically feature just the face of the Inca warrior against the backdrop of a shield or a temple. These pre-Columbian warriors inhabited what would be Peru today, and their location at great altitudes gave them exceptional resilience in battle. Samurai Warrior: usually masked and portrayed with a sword, the Samurai warrior represents courage, discipline, bravery and honor. Scottish Warrior: often portrayed with St. Andrew’s cross or as a particular tartan, the Scottish warrior tattoo design represents Scotland’s distinctive history and culture. Each group of warriors from the past had a distinctive battle philosophy and combat style, but each had its unique advantages. Warrior tattoo designs are a powerful reminder of the strength of our ancestors, and they can help anchor us in our own daily lives. 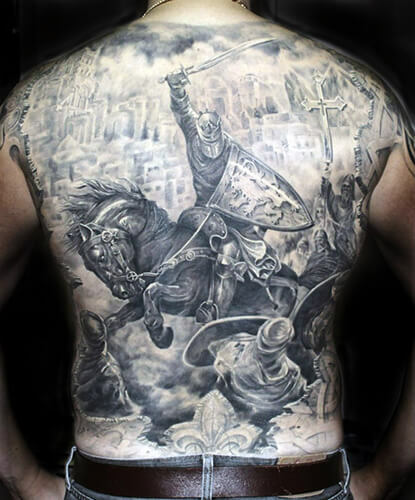 If you know of other significant warrior tattoo designs, let us know about them in the comment section below!